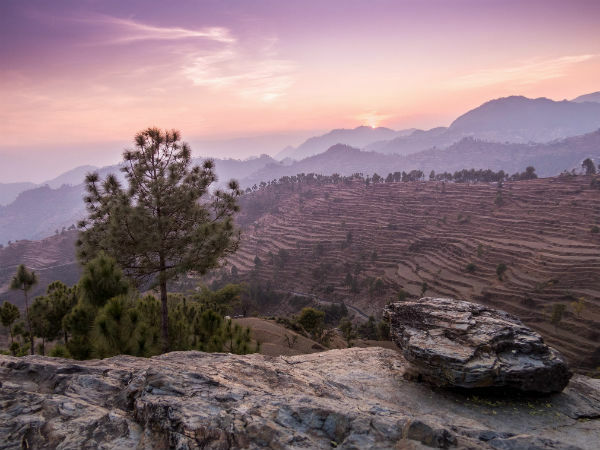 Tucked away on the southern edge of Kumaon hills of the mighty Himalayas, Almora is a picturesque town in Uttarakhand that is believed to have been established by King Kalyan Chand in 1568. Almora is said to have got its name from a short plant by the name Kilmora, which was used to wash utensils at the infamous Katarmal Sun temple. People who brought Kilmora came to be known as Kilmori and thus, it evolved to what it is now known as Almora. Almora is snuggled within the peaks of Himalayas; therefore, it gives a brilliant view of the mountains all around the town. It is located at a distance of 360 km from Delhi so pack your bags and explore this breathtaking town right away! The climate of Almora remains pleasant throughout the year. However, summer is the peak season since the weather is ideal for sightseeing and perfect for trekking. Winter can be freezing so preferably visit Almora either during summer or even monsoon, when the rains turn the landscape of the town lush. Since route 1 is shorter and faster, we recommend you to pick the first route. The slowly developing industrial city of Ghaziabad is located 41 km from Delhi. The city is known as the Gateway of UP since it is the first place you see as you leave Delhi and enter Uttar Pradesh. You can make a stop at this city to visit some places, such as the ISKCON Temple, or shop at the many shopping complexes that are lined up on the streets of Ghaziabad. Moradabad is a quiet city that was established by Rustam Khan in 1625 AD, but was named after Shah Jahan's son Murad Baksh. Settled on the river Ramganga's bank, the city is popular for their industry of brass handicrafts. Don't forget make a purchase at Moradabad if you are interested in intricate handicrafts and designs. Mandawar Ka Mahal, Jama Masjid and a Sita temple are some of the places you may visit if you stop at Moradabad. The cantonment town of Almora is rich with the history of Chand dynasty and Katyuris, before it was taken over by the British Raj. This quaint town is popular for its spectacular handicrafts, delicious local cuisine and a wonderful landscape that is spread with lush greenery along with two rivers namely, Koshi and Suyal, flowing through it. Here are the places you can visit in and around Almora. Built in the 9th century by the King of Katyuri dynasty, Katarmal Sun Temple, as the name suggests, was built in dedication of Sun God. The beautiful temple reflects the brilliant architecture of the time. The wooden doors and a few other parts of the temple can now be found in Delhi's National Museum, which is under the protection of the ASI. Sun God's image in the temple is said to be installed in the 12th century though the temple was built in the 9th century. Dedicated to Kasar Devi, the temple is perched at a height of 6900 ft above sea level, therefore, giving a beautiful panoramic view of the surrounding mountains and thickets of pine and deodar trees. Many believe that Swami Vivekananda and few other meditators have meditated here. During Kartik Poornima which falls between the months of November or December, the temple holds a grand Kasar Devi Fair when the temple tends to be crowded with devotees. Binsar, once the summer capital of the Chand kings, is now a wildlife sanctuary that is located in the Himalayas and 33 km from Almora. Zero Point is a peak in Binsar from where you can get a breathtaking view of numerous Himalayan peaks, such as the Kedarnath, Shivling and Nanda Devi. Animals like leopards, musk deer, black bears and over 200 species of birds, such as forktail, blackbirds and magpies are what you can expect to witness in this sanctuary.